Glass top stoves are becoming more and more popular, and it’s no wonder! Glass top stoves are much easier to clean, and the flat surface looks very sleek and it can give a modern look to your kitchen. However, glass cooktops are also much easier to scratch than standard cooktops. For this reason, they require a specific kind of cookware. However, finding cookware that is compatible with glass top stoves is not that hard. In fact, there are so many options to choose from that it might be quite difficult to decide which pots and pans are the best for your stove. There is no need to worry, though – we have researched thoroughly all of the options available online to make the choice easier or you. 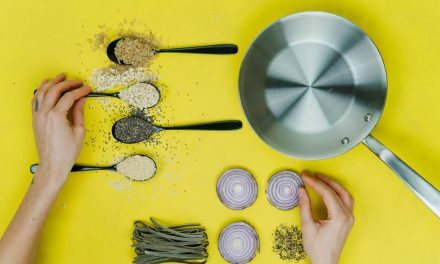 After weighing out all of the pros and cons, we have created this list of 6 best non-stick cookware sets for glass top stoves. Not everyone has the same needs when it comes to cookware, of course, but we believe that you’ll certainly find something you like among these awesome cookware sets. 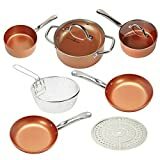 Copper Chef Cookware 9-Pc. Round Pan Set - Aluminum & Steel With Ceramic Non Stick Coating. Includes lids, frying and roasting pans accessories. 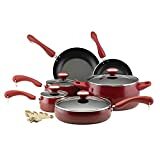 This 6-piece set is made heavy-duty hard anodized aluminum and it’s compatible with glass top cooktops according to the manufacturer’s instructions. These pots and pans are a bit on the heavier side, but this is because of the sturdy construction that also makes them extremely durable and impact-resistant. The aluminum core heats up quickly and the non-stick coating on the inside really works. Your food will slide right off, even if you don’t use much oil. The best thing about Calphalon’s special 3-layered non-stick interior coating is the fact that it’s extremely scratch-resistant. 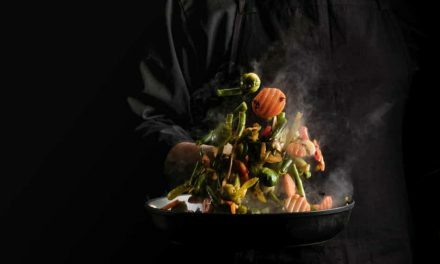 You can even use metal utensils when cooking which is not always the case with non-stick cookware. You can also wash all the pieces from this set in the dishwasher, which makes life much easier. 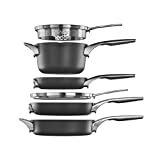 Calphalon Premier Space Saving Nonstick 6 Piece Set offers great cooking performance, but that is not the only feature that makes it stand out. What we actually love the most about this set is the fact that it is securely stackable, allowing you to save tons of space! So what exactly does this set contain? First of all, there are two frying pans. The smaller one has a diameter of 8 inches, and the bigger one’s diameter is 10 inches. There is also a 3.5-quart saucepan with a straining lid and a 3-quart saute pan with a lid. Now, the saucepan is also 8 inches wide, which means you can stack it with the 8-inch pan, while the saute pan is 10 inches wide so it stacks with the 10-inch pan. You can also use the 10-inch lid both on the 10-inch pan and on the saute pan. What’s amazing about Calphalon’s space-saving design is the fact that they have essentially created a completely new concept of a lid. The tempered glass lids they offer are completely flat, which makes them much easier to store than standard lids. Limited space in their kitchen. 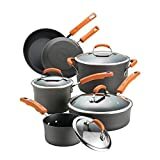 Even though there are only 6 pieces, this set offers everything you need in order to cook for a small family, and if this is not enough, they also offer a 15-piece set. However, you can also buy additional pieces separately. If you get the same diameter, you’ll be able to stack them with your set. Overall, this is one of the most functional cookware set for glass top stoves we’ve seen. Heavy gauge construction heats up quickly and evenly. Durable DuPont Teflon Select nonstick interiors provide easy cleaning and long-lasting food release. Want to bring some color into your kitchen? The Paula Deen Signature Collection Porcelain Nonstick 15-Piece Cookware Set comes in 6 beautiful colors! The speckled outside exterior comes in cheerful red, romantic lavender, coral, yellow, and two shades of blue. This means you can also easily match this cookware set with the color scheme in your kitchen. Furthermore, this cookware set is a great gift for someone special, since you can probably get it in their favorite color. The set includes 2 saucepans, 2 skillets, a stockpot, and a saute pan. The capacity of the smaller saucepan is 1 quart, while the bigger one is a 2-quart saucepan. The 1-quart saucepan works well for making sauces, of course, but it will also come in handy for boiling water for tea or anything else. Besides, it’s the perfect size when you are cooking anything for one. The 2-quart saucepan, on the other hand, is perfect for soups. The stockpot in this set is quite large – it holds 6 quarts of liquid, but it will be very useful when you need to cook for a larger group of people. Add a saute pan, and 8-inch skillet, and a 10-inch skillet to all of this, and you can truly cook anything with this set. The Paula Deen Signature Collection Porcelain Nonstick 15-Piece Cookware Set also includes a 5-piece set of measuring spoon which is a nice addition. All of the pieces in this set have a nice and durable Teflon non-stick interior coating. However, you should keep in mind that metal utensils shouldn’t be used with this type of coating in order to avoid scratching. Furthermore, the saucepans, the stockpot, and the saute pan all come with transparent tempered glass lids. The lids fit tightly so they lock in the steam and the flavors which is nice. Finally, the dual-riveted handles and the lid caps come in colors that match the exterior of the pots and pans. The handles are quite large and comfortable and they have a nice and soft finish that provides a secure grip. There is a metal ring with a copper finish on the end of each handle which gives a nice touch and makes it possible to hang every piece from this set which helps with organization. We especially like the frying pans. If you’re on a tight budget, you’ll also be glad to learn that this set comes at quite an affordable price. However, this doesn’t mean it’s quality is low. In fact, the Paula Deen Signature Collection Porcelain Nonstick 15-Piece Cookware Set offers great performance and it will certainly last for many years! Rachael Ray’s kitchenware collections are all about simple solutions that make your life easier and cooking more fun. The Rachael Ray Hard-Anodized Nonstick 10-Piece Cookware Set is just that – simple, functional, and easy to use. The set consists of two saucepans with lids in different sizes, a large stockpot, a 3-quart saute pan, and two skillets. The stockpot and the saute pan also come with shatter-resistant transparent lids that allow you to keep an eye on the cooking process without having to remove the lid. All the pieces are made of hard anodized aluminum. They feature a non-stick inside layer and a clear exterior coating which are both dishwasher safe and easy to clean. The rubberized double riveted handles are soft but still provide a firm grip. The pots, pans, and lids can be used in the oven on temperatures lower than 350 degrees Fahrenheit. Overall, this is a nice, functional set. It comes with all the pots and pans you need to cook breakfast, lunch, and dinner for the whole family. The hard anodized aluminum is quite durable and provides even heat distribution. With this set, cooking will certainly become an enjoyable experience for the whole family! Even though the name is Copper Chef, these pots and pans are actually made of aluminum with stainless steel bottom plates and a non-stick coating on the inside. This combination allows this set to be compatible with all kinds of stoves, while simultaneously providing even heat distribution and easy cleaning. The non-stick coating on these pots and pans can stand extremely high temperatures. This means that you can use all of the pieces in the oven at temperatures as high as 850 degrees Fahrenheit. Furthermore, the Cerami-tech non-stick outer coating in copper color gives this set a really nice and classy look. Not only this, but it makes the exterior of the pots and pans very easy to clean. The contents of the Copper Chef Cookware 9-Pc. Round Pan Set –Aluminum & Steel With Ceramic Non-Stick Coating are slightly different than other standard sets. In fact, it comes with some accessories that can be quite useful. Specifically, it includes a 9-inch round steamer tray and a fry basket. When it comes to standard pots and pans, this set includes two saucepans, two round frying pans, and a casserole pan. 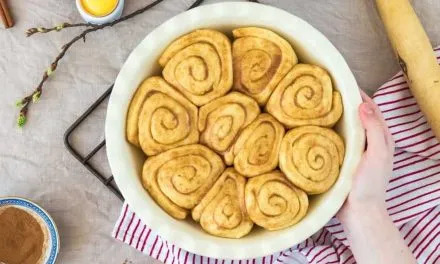 The casserole pan can also be used for deep frying thanks to the non-stick coating and the frying basket fits perfectly into it. It also includes two heat-resistant glass lids. Overall, this is quite a nice and versatile cookware set. It comes with a fry basket and a steamer tray which makes it possible to cook literally anything by using this cookware set only. It comes at a very reasonable price too so it’s definitely worth considering. Woll is a German manufacturer that uses a unique diamond technology to create premium non-stick cookware. The result of their manufacturing process is a range of extremely resistant pots and pans that have an exceptionally smooth cooking surface that keeps the food from sticking. Their cookware is not only impact-resistant, but it is also quite lightweight. Their products are at the higher end of the price range, but they are definitely worth the price. The extremely tough non-stick coating with embedded diamond crystals can truly endure anything, so you can use metal utensils with Woll cookware without ever worrying about scratches. You can also wash every piece in the dishwasher which is always a relief. Furthermore, the non-stick coating is PFOA-free and completely safe. All of the pieces in the Woll Diamond Plus/Diamond Lite 10-Piece Cookware Set have been carefully designed down to the finest details. All of the pots and pans have reinforced edges which make the cookware even more durable and also make pouring easier. The handles stay cool on the stovetop and provide a firm grip. Furthermore, you don’t ever have to worry about handles falling off since they have double riveted brass inserts. The set contains two frying pans – one with an 8-inch diameter and the other one with a diameter of 9.5 inches. You also get 3 deeper pans (two saucepans of different sizes and one stockpot) and an 11-inch saute pan. All of the pieces except the frying pans come with heat-resistant glass lids. The larger saucepan has a diameter of 8 inches, so you can also use the lid that comes with it with the 8-inch frying pan. Even though it costs more than some other non-stick sets, the Woll Diamond Plus/Diamond Lite 10-Piece Cookware Set is definitely one of the most durable and indestructible sets of non-stick cookware we have ever seen. It’s also perfect for glass top stoves since it won’t leave any scratches. If you are looking for an all-purpose cookware set that will serve you for many years to come, this 10-piece set from Woll might just be the right choice. The Circulon Genesis Stainless Steel Nonstick 10-Piece Cookware Set combines stainless steel with a non-stick finish! This way, you get the durability and resistance of stainless steel, but the non-stick coating allows for easy cleanup and oil-less cooking. It really brings together the best of both worlds. All the pots and pans in this set come with aluminum cores in their bases. Stainless steel doesn’t conduct heat very well, but aluminum is one of the best heat conductors. Thanks to the aluminum core, these pots and pans heat up really quickly and distribute heat evenly, without hotspots. On the other hand, the stainless steel exterior is completely resistant to rust, scratching, and any kind of damage. The interior is covered with a non-stick coating, but not just any kind of coating. It is Circulon’s TOTAL Food Release System which is PFOA-free, sturdy, and scratch-resistant which means you can safely use metal utensils with this cookware. It works just like ordinary stainless steel, but the food will never stick to the surface. Instead, it slides right off. The Circulon Genesis Stainless Steel Nonstick 10-Piece Cookware Set includes a 1-quart saucepan, a 2-quart saucepan, a 2-quart saute pan, a large stockpot, and two frying pans. The smaller pan has a diameter of 8.5 inches, which makes it perfect for frying eggs or making omelets. The large frying pan is 10 inches wide. The two saucepans, the saute pan and the stock pot come with tightly fitting transparent lids made of shatter-resistant tempered glass with stainless steel handles. Since all parts are made either of stainless steel or of tempered glass, you can safely put any piece of cookware from this set into the oven. It can stand temperatures up to 500 degrees Fahrenheit. Finally, the Circulon Genesis Stainless Steel Nonstick 10-Piece Cookware Set is dishwasher-safe and compatible with all kinds of stovetops, even induction. The Circulon Genesis Stainless Steel Nonstick 10-Piece Cookware Set comes aw a very reasonable price, but it feels like cookware that costs much more. It’s functional, durable, and versatile. Overall, it gets a thumbs up from us! Undoubtedly, there is a lot to take into consideration when choosing a new cookware set. 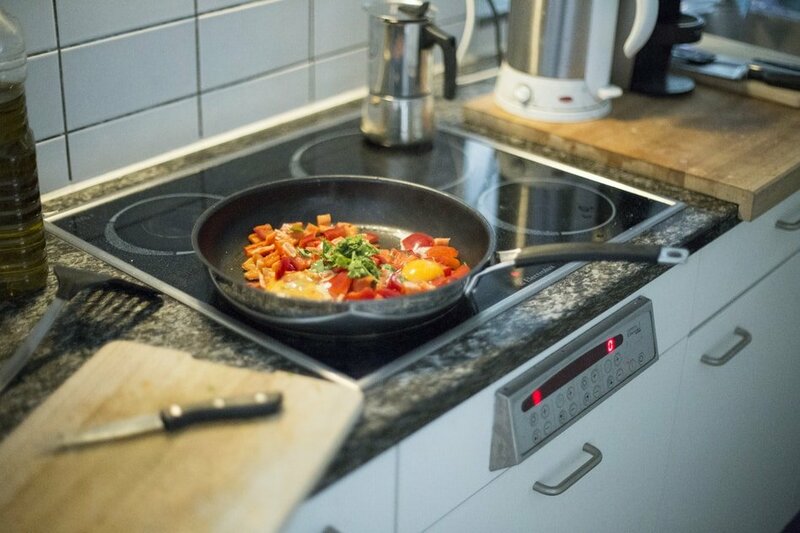 When it comes to cookware for glass top stoves, the first thing you need to consider is the material the cookware is made of. Cast iron, for example, is a no-no, since it can scratch the glass surface quite easily. On the other hand, non-stick aluminum cookware is always a safe choice. It has many advantages too – it heats up quickly, it’s easy to clean, and you don’t have to use a lot of oil. 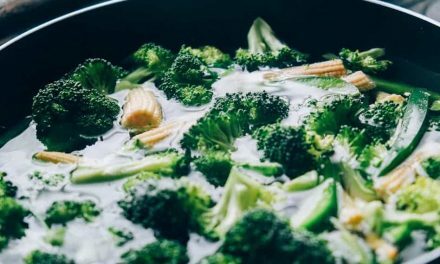 Many people worry about aluminum being unhealthy and coming in contact with food, but in reality, as long as you don’t damage the non-stick coating, your food is completely safe! However, if non-stick aluminum is not up your alley, you still have other options. The Circulon Genesis Stainless Steel Nonstick 10-Piece Cookware Set, for example, combines the best features of stainless steel with a non-stick interior! When it comes to non-stick coatings, not all of them are safe to use with metal utensils. Therefore, if you prefer using metal utensils over wooden or silicone utensil, make sure to check if it is safe to do before you choose a cookware set. 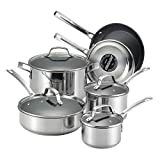 The Calphalon Premier Space Saving Nonstick 6 Piece Set, the Woll Diamond Plus/Diamond Lite 10-Piece Cookware Set, and the Circulon Genesis Stainless Steel Nonstick 10-Piece Cookware Set are all metal-utensil approved according to the manufacturer’s’ instructions. Finally, you should also take into consideration the contents of the set itself. The Calphalon Premier Space Saving Nonstick 6 Piece Set is smaller than some other sets, but it contains all the essentials and it’s easy to fit into even the smallest kitchens. On the other hand, the Copper Chef Cookware 9-Pc. Round Pan Set –Aluminum & Steel With Ceramic Non-Stick Coating comes with a frying basket and a steamer tray included, so it might be the right choice for those looking for a more comprehensive cookware set. Whatever you choose, we hope this guide has helped you make the right choice!